It’s been 36 days since Hurricane Maria ravaged Puerto Rico. Yet 74% of the island’s 3.4 million residents still don’t have power. The 1.25 billion hours lost is more than double the hours lost due to Hurricane Katrina and 473 million more hours lost due to Hurricane Sandy. Hurricane Georges, which hit Puerto Rico, the U.S. Virgin Islands and the Gulf Coast in 1998, is the only other event in U.S. history to cause more than 1 billion hours in lost power. Another hurricane this year also made the list, with Irma being the fourth largest blackout in American history owing to huge power outages in Florida and Georgia. But what’s happening in Puerto Rico is in a class of its own. The storm destroyed the entire electrical grid that was already shaky at best. Puerto Rico’s Governor Ricardo Rossello has set a goal of restoring power to 95% of the island by December 15, but the U.S. Army Corps of Engineers expects that won’t happen until January or February. 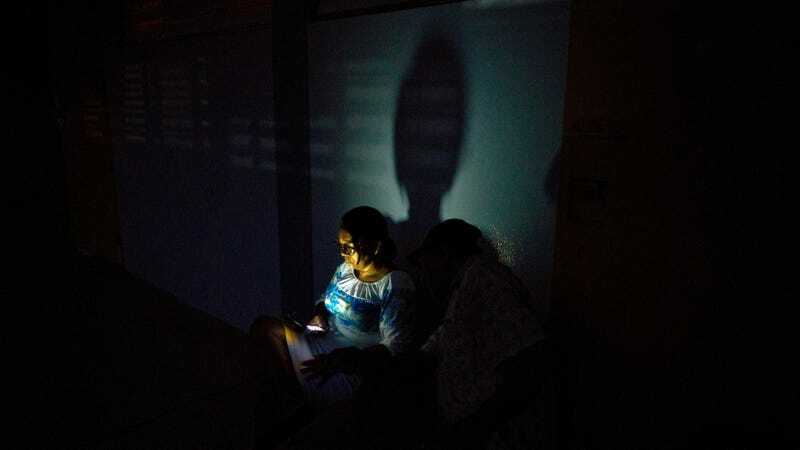 Even under Rossello’s better-case scenario, the island—along with the U.S. Virgin Islands, which is facing a largely similar situation while getting much less attention—could rack up 2 billion hours in lost power according the analysis. The widespread power outage means things we take for granted like lights, refrigeration and air conditioning become luxuries. Doctors have been forced to operate by cell phone light. The longer the power stays out, the longer it takes for stores to reopen and people to return to work. Houser authored a New York Times piece with University of California, Berkeley economist Solomon Hsiang in the wake of the storm warning that Maria could lop 21% off of Puerto Rican’s incomes over the next 15 years. Getting electricity restored is priority number one to avert a worsening humanitarian crisis. But the future of climate change-intensified storms means the grid will have to look different than it did before Maria. There are signs that’s already happening. The lessons Puerto Rico is learning are ones other parts of the U.S., as well as other Caribbean nations, would be wise to heed because the problem of hurricane-caused blackouts isn’t going to go away. In fact, it’s probably going to get worse.